A few days ago an e-mail went out announcing the results of the 2018 NPSoT photo contest. Below I’ve copied the parts of that message pertaining to me (toot toot). Some of the pictures (or variants) have appeared in my posts but others have not. You can click an image to enlarge it quite a bit. Photo contest winners from all 12 Level III Ecoregions in Texas. Winners were chosen by popular vote and first announced at the 2018 Fall Symposium in San Antonio. And so I did, though a bit self-consciously. Well done, Steve and richly deserved. I’m glad I can show off the richness of nature in Texas. It’s a rare chance to show off so many regions at one time. wow, well deserved, steve. huge congrats! Thank you. You can see the natural diversity Texas offers. Toot and hoot away, my friend! You submitted some spectacular images! I’m curious, how many photos were you allowed to enter and was it a long process to go through? I’ve found over the years that some contests make the process quite easy, while others I no longer submit images to due to the simple fact it’s just too time consuming. Thanks, Lori. Along the lines of your last sentence, here’s what I wrote to Linda (shoreacres) in an e-mail the other day: “The fact that there were so many regions as categories—a full dozen—plus having to figure out which region each photograph was taken in, and having to give the name of at least one native plant in each photo (which I approve of), as well as making sure no invasive non-natives got included (which I also approve of), probably dissuaded a lot of people from entering the contest.” As I remember it, members (and you had to be a NPSoT member) could submit one picture for each of the 12 ecoregions. There was one region I didn’t have anything worthy from but I submitted a picture for each of the other 11. Goodness! That sounds like a lot of sorting and cataloging (which I’m sure you have done in advance to some measure), not to mention deciding which image shows the greatest merit. In a post where you might have several photos, I often cannot decide which image is most pleasing – they ALL appeal. Your work and eye for detail certainly paid off! Congratulations!! My photo archive is arranged by the date and place where I took the pictures. In a few instances a place lay near the border between two of the contest’s ecoregions, and I spent more time than I wanted to in deciding which was the right region. More generally, as you said, I had to pick just one photograph from a region, when in some cases (the regions closest to home) I had literally thousands to choose from. To your other point: when I show more than one picture in a post, I generally make them quite different. There’s usually nothing to be gained, and much to be lost, by showing similar photographs at the same time. One exception would be if a photographer has a few similar images and is asking people which they think works the best. Following your pattern, I could say it’s peachy. A lot of your time and expertise was involved in getting these shots, especially photos that garner sufficient attention from the public to win. According to the NPSoT website you took home the lion’s share of the awards…Congratulations Steve! Given your interest in astronomy, let’s just say I have momentary star power. I saw all of those photos in the NPSOT release. You *should *be tooting your own horn! Sincerest congratulations! You really get around, don’t you! Beautiful photos! Speaking of getting around, I was fortunate to have gotten at least some good pictures in 11 of the 12 Texas ecoregions. Wow! Great photos and worthy prize winners. Hey that’s wonderful! Well done, you. Add some ice cream and you could say I got my just desserts. Your photos are prized by many! You’re welcome. Being prized by many is the best prize of all. Congratulations, your devotion is rewarded. You can measure my devotion by the number of times I sally forth into nature. Congratulations Steve! All your wonderful photos and very worthy of prizes – glad you got the recognition. By the way, is the expression ‘blow your own trumpet’ used in the US? I’ve heard a bunch of variants over here, including blow your own horn, toot your own horn, blow your own trumpet, beat your own drum, ring your own bell. Thank you. I’m happy to show off Texas. I’m glad to see you getting some very well deserved recognition! Your photos are always gorgeous! Texas even has a few gorgeous gorges, though I didn’t show any here. With your avian interest, I’ll say this was a feather in my cap. You RULE, Steve! Congratulations from Ariana and Michael in Houston! This morning we watched the 1979 movie “A Little Romance.” At one point the character of the mother, an American, is desolated to learn that she’s going to have to move from Paris (France) to Houston. I imagine you guys don’t share her feeling. You’re welcome. I’m happy to promote the pleasures of nature in Texas (and occasionally elsewhere). Congrats! Nice enlarged views when clicking! Great that you got so many awards from so many areas in Tx! Makes me think of Beach Boys’ “I Get Around”, which you surely did! Not even counting your traveling outside Tx for loads of other pix you’ve published! Thanks, Wanda. As you know, I don’t normally show such reduced versions of photographs as the ones included in the NPSoT email (which I copied), but fortunately that email already had all the links in place to connect to larger views. If you consider that I’ve been photographing native plants for 20 years now, it’s not so strange that I’ve gotten to other parts of the state, even if not nearly as many as I’d have like. Grazie, Susanna. Your recent travelogues made that seem like an appropriate language in which to reply. Thanks, Ken. So much work went into all those pictures. Of course I remember that white prickly poppy. It (or something very close to it) always has been one of my favorites among your photos. The penstemon almost looks like a botanical drawing, and the fern is delightful. As it happens, I saw my first Castilleja indivisa this afternoon. Maybe I’ll be lucky enough to see some C. purpurea this year, as well. You’re lucky to have traveled so widely, and collected so many great images — and good that you had a chance to share them with the NPSoT members. I made sure to submit a variant of the white prickly poppy photo that appeared here, as one of the contest’s rules was that a picture shouldn’t have been previously published. We can debate whether a blog post counts as publishing, but since I had decent variants, why not just use one? I’d never thought of the penstemon picture as being like a botanical drawing. Now that you bring it up, I can imagine it. Happy Castilleja indivisa to you. In the same strip of land where I photographed early bluebonnets this week, I once found an Indian paintbrush flowering in December. Good luck finding a purple specimen this year (and yellow and orange, if you haven’t come across those yet). Congratulations! When I first looked through them, I though that these were all the winning pictures, and that they were all yours. I get it that there were others too. I do not remember most of these. Actually, now that I look again, these all look new to me. the pictures from the contest that appeared in my blog (or variants) did so in the years before you were visiting. I’ve been at it for going-on eight years now, so you haven’t seen most of the photos I’ve posted. Yes, I had only seen recent pictures. Thanks, Lavinia. 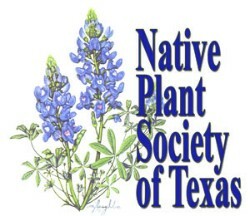 I’ve done my part in promoting the native plants in Texas. Toot away! 8 out of 11 entries? You have certainly earned that right. – The Penstemon buckleyi is so perfect it looks like an old botanical illustration. – The example of the Galveston Cemetery is a perfect way to cover hallowed ground in remembrance of those who were loved. Why doesn’t every cemetery do this? – The detail in the Osmunda cinnamomea is stunning! Anyone who did not click for a closer look totally missed what is really there. As always, your work is amazing, Steve. Thanks for your vote of confidence, Lynda. I won’t deny that getting 8 wins in 11 submissions is good, but I’ll add that not many people entered photographs in the contest. Alas, for a few of the 12 regions I was the only entrant! Unfortunately, when I returned a couple of times in the spring in later years I found the cemetery heavily mowed and devoid of wildflowers. The same thing happened with a cemetery to the southeast of Austin that had looked gorgeous covered with wildflowers when I first came across it. Call it the sad effects of global mowing. I note that your photograph was a foreshadowing. I have seen, on closer inspection, the tractor in the background. Some just don’t get it. I didn’t read Linda’s comment, but I will go to it now. She and I often think along similar lines. Yes, you and she do often think along similar lines. Congrats – well deserved IMHO!! Thanks, Nora. I’m quite willing to accept your opinion. I definitely remember the Argemone albiflora. I think you showed it to me when I found the Argemone mexicana, which at that time I thought it was a big deal. I’d still agree that the flowers of the Argemone species are a big deal. I look forward to seeing them each new spring. They are a big deal, but the yellow ones are very common now. ‘Albiflora’ definitely doesn’t like it here as much and would be a nice find in the future. Congrats on all your winnings Steve! Thanks, Maria. Our Argemones are reversed: in Austin we see plenty of the white flowers but the yellow don’t occur at all. What a wonderful validation of your photography, Steve. My heartfelt congratulations. Thanks, Tanja. I’ve been working at native plant photography for two decades now, still looking for new ways to depict my old friends. I suspect you’re right, and that I’ll run out before the motifs do. I hope that won’t happen for a long, long time! Thanks for your thought, even if nothing on earth is eternal. Thanks, Denise. Spring is about to come to central Texas. Congratulations on the wins! You’ve certainly worked hard enough at your craft over the years. I’m glad to see you getting recognition for it. Thanks, Nancy. I appreciate your many comments here since 2012. Wow – it’s been that long already?? Recognition is always nice to receive and you received quite a bit with these. Well deserved and congratulations. Thanks, Steve. You know what it’s like to live out your passion, so recognition is welcome. via gmail notices, i read wp posts off line, follow the link to open that site, then wait until the next internet connection to see the images. Wow! You dominated the awards – and definitely deserve recognition! My favorite was/is “Penstemon buckleyi” – so soft and delicate, it looks like a scientific illustration. it’s always great when talent is recognized via platforms like the Plant Society/Tx – especially some of the nice people of the world get the awards!!! You’re the third person to comment that the Penstemon buckleyi looks like a botanical illustration. I hadn’t thought of it that way but I can understand your impression. I’m also glad that I could show such pretty flowers at a place where people probably wouldn’t expect it: a sand dune.